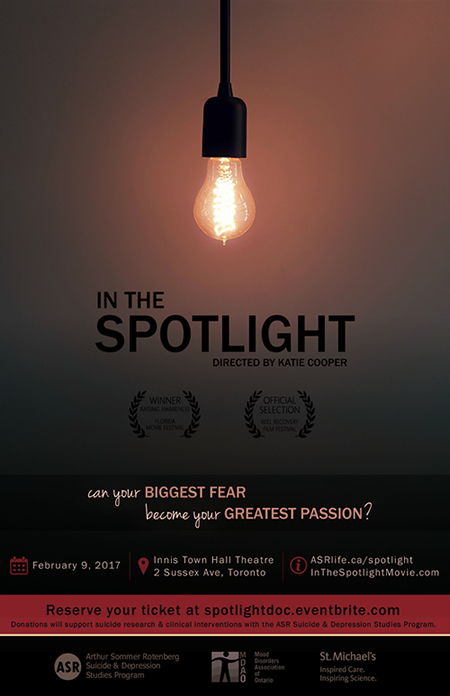 On February 9, the ASR hosted a feature screening of the documentary In the Spotlight, directed by Toronto-based filmmaker Katie Cooper. In The Spotlight is a documentary exploring social anxiety disorder (also known as social phobia), one of the most common yet under-represented mental health issues experienced by Canadians today. The film focuses on the inspiring true story of Earla Dunbar, a woman who went from housebound for six years to founding and leading the largest social anxiety support group in North America and becoming a mental health advocate. Toronto-based filmmaker Katie Cooper and her camera followed Earla’s journey over six years creating a captivating and poignant story about acceptance, recovery, and giving back. All donations from the event went toward supporting mental health education/advocacy events and research with the ASR Suicide & Depression Studies Program. Learn more about the documentary on Katie Cooper’s In the Spotlight film page.